Celebrate this Diwali with cheap and Best android phones. We all love to celebrate Diwali with gifts and crackers. You may be wondering what gift to pick this Diwali for our family and friends. Why not to give an economical gift which will be memorable gift forever. Why don’t you give a smart phone? This may make your Diwali very special this year. Yes, I am taking about few android phones which are really cheap and best when it comes to Indian market. Many people are showing interest in using the android devices unlike before. Take a look at few best android phones which are very economical and very popular. I will give you a list of top 10 android phones which are under 10k in Indian market. Here goes the list. We are mentioning the price and rating of the phone under each phone. But please note that our personal ratings are applicable only to these top 15 cheap and best android phones under Rs: 10,000. 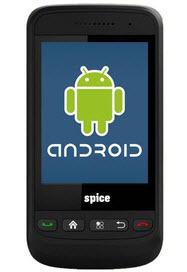 1) Spice Mi-270: The Spice Mi-270 is the first Dual SIM Android Smartphone. This powerful dual SIM (GMS + GSM) android Smartphone runs on Android 2.2 OS and is powered with 600 MHz MediaTek Processor. This model is included with a physical android and call buttons. The display screen is 240 x 320 pixels with 2.8 inch touch screen. It has a 2 MP camera with digital zoom, multiple scene modes and variable color effects. GPRS, EDGE and Wi-Fi are enabled. The Spice Mi-270 comes with a multi format music player with a clutter free interface which sorts the song based on type of artist and album selected. The battery is powered with a 1000 mAh battery that gives 3 hours of talk time. The standby time is around 320 hours and the phone supports microSD cards which can be expanded to 16GB. The Cost of Spice Mi-270 in India is around Rs: 5649/- Our rating is 3/5. 2) Micromax Bling 2: This phone is more interesting to women who love to text, and understand gadgets. 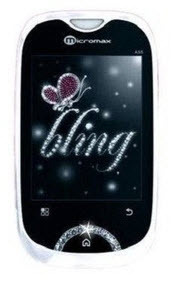 The Micromax Bling 2 comes with a SWAROVSKI ZIRCONIA in the front and back panels. The phone sleek design is targeted to urban lifestyle. 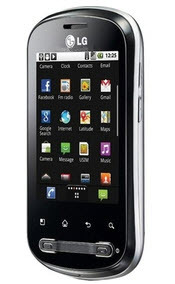 Micromax Bling 2 is a full touch Smartphone with android 2.2 as its operating system. The phone sports with a 3 MP camera with auto focus. It can record 720p HD videos. Geo-tagging is another interesting feature in the phone. The phone also features touch focus, image stabilization, satellite based navigation system and can connect up to 8 devices with Wi-Fi. The display screen is 2.8 inch full touch screen with LCD display. The battery comes with a 1000 mAh Li-Ion standard battery which supports 240 minutes of talk time. The internal memory is 150 MB and can be expanded up to 32GB using a micro SD card. The cost of Micromax Bling 2 in India is around Rs: 6196/- and our rating is 2/5. 3) Karbonn A 1: The Karbonn A1 is a stylish android Smartphone which runs on Android v2.2 OS. The phone looks good in black when compared with white. The phone comes with a 150MB in built internal phone memory, which can be expanded to 32GB with microSD and microSDHC cards. The phone has a 256 MB Ram and a 2.79 TFT Screen with a 240 x 320 pixels resolution. The phone has a 3.2 Megapixel camera and supports 3G network. Karbonn A 1 is powered with a 1100 mAh battery which gives 4 hrs of talk time and 250hrs of standby time. A very good music player which supports almost all formats and you can also record and watch videos in this phone with few standard formats. The voice recording is preloaded in this device. The cost of Karbonn A 1 in India is around Rs: 6400/- and our rating is 3/5. 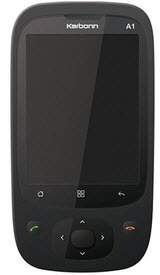 4) Vodafone 858 Smart U8160: Vodafone 858 Smart U8160 has a 2.8 inch display with resolution of 240 x 320 pixels. This phone is powered with android v2.2 and has a 528 MHz ARM 11 processor. The adreno 200 GPU which is present in Vodafone 858 Smart U8160 supports 3D graphics. The phone has a 2MP camera with Geo-tagging and it has sensors like accelerometer for auto rotate. Also has a ambient light and proximity sensor. The handset is powered with a standard battery which provides a talk time of 4 hours and 252 hours standby time. The phone has a 2G and 3G support where 3G can give you 380 hours of standby time. The internal memory of the device is 130 MB, which can be expanded to 32GB using microSD, microSDHC cards. The music player and FM radio are very efficient. The phone has GPRS, EDGE, 3G and Wi-Fi access. The cost of Vodafone 858 Smart U8160 in India is around Rs: 6695/- and our rating is 3/5. 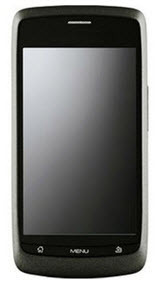 5) LG Optimus Me P350: This phone is a full touch mobile with a 2.8 inch TFT display. The display resolution is 240×320 pixels and supports multi touch navigation. LG Optimus Me P350 is preloaded with android v2.2 and works on both 2G and 3G networks efficiently. The phone is integrated with Facebook and Twitter sites to stay connected with your social circle. The phone has a 3 MP camera and can shoot images at 2048 x 1536 pixels with auto focus. You can also record VGA videos at 24FPS. Coming to the battery, the LG optimus Me has a 1280 mAh Li-ion battery which give a solid 11hours of talk time. The internal memory is 155MB which can be expanded to 32 GB with a microSD card. You can see a LG App advisor which crawls through the android market to give you customized recommendations. 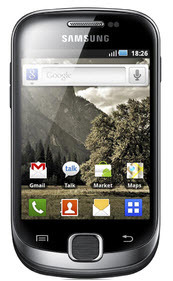 The cost of LG Optimus Me P350 in India is around Rs: 6800/- and our rating is 4/5. 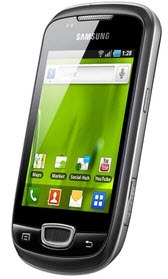 6) Micromax A70: The Micromax A70 is successor to its previous version Andro A60. Micromax A70 has a better screen resolution, higher MP camera and an upgraded OS when compared to A60. The Micromax A70 runs on Android v2.2 and brings in Wi-Fi tethering and easy notification bar access to wireless radios. The device has a 600 MHz processor which allows handling much of the apps without any lag. Micromax A70 has a amazing 5 MP camera on the rear and a VGA camera on the front. The phone has a 3.2 inch capacitive touch screen that packs 320 x 480 pixels resolution. The phone display sensors will switch off the display when you bring the phone close to your face. The powerful 145o mAh battery gives a 4hours talk time and a standby time of 200 hours. The internal memory of Micromax A70 is 160 MB and expanded up to 32 GB with a microSD card. There a lot of other features like Wi-Fi, 3G which makes Micromax A70 an amazing phone. The cost of Micromax A70 in India is around Rs: 7500/- and our rating is 4.5/5. 7) Samsung Galaxy Pop S5570: The Samsung galaxy pop s5570 is very popular phone with amazing features. This full touch phone is powered by a 600 MHz ARM6 processor and runs on android 2.2 OS. This smart phone has a 3.14 inch screen with 240 x 320 pixel resolution. The phone works in both 2G and 3G consistently. Samsung Galaxy Pop is preloaded with social networking apps like Facebook, Orkut and Twitter. The phone has a 3 MP camera with 3x digital zoom and video recording capabilities. You can shoot videos with 320 x 240 resolutions at 15fps. The internal memory of this device is 164 MB and can be expanded to 32GB by using microSD card. The standard Li-Ion 1200 mAh battery is used in the phone gives a talk time of 9 hours in 2G and 6hours in 3G. The document viewer and editor will let you view/edit your documents on your phone. An integrated A-GPS system will ensure you reach your destination in right way. The cost of Samsung galaxy pop s5570 in India is Rs: 8000/- and our rating is 5/5. 8 ) Dell XCD35 : The Dell XCD 35 is a powerful android touch screen phone which was an upgrade over Dell XCD28. It runs on android v2.2 operating system and has with 3G and Wi-Fi features. The phone is powered with a ARM11 600 MHz processor. Dell XCD 35 supports faster multitasking with less power consumption. The display screen is 3.5 inch with 262k colors at 800 x 480 pixels resolution. The screen clarity of the phone is really amazing and it supports faster refresh speeds. The phone has a auto focus 3.15 MP camera with multiple shoot modes. The internal memory of the phone is 200MB and can be expanded up to 16GB with micro SD memory cards. The battery has a backup of 4hrs talk time and 216 hrs of standby time. The music player and FM radio adds additional fun to the device. The cost of Dell XCD 35 in India is around Rs: 8,699/- Our rating is 5/5. 9) Samsung Galaxy Fit S5670: This is another Samsung product which is famous for its amazing features. The phone comes with a android 2.2 and features with many amazing option at an amazing price. The device has a 5MP camera which offers a range of shooting modes like Panorama shoot mode with 2x digital zoom. Samsung Fit is powered with a 600 MHz processor, and features Samsung’s Touchwiz 3.0 android skinning. The Samsung fit sports a 3.3 inch TFT touch screen with 240 x 320 pixel resolution. Samsung Galaxy Fit S5670 is preloaded with content tools like Hybrid Widgets and offers up to 7 multiple home screens. The device has a multi format music player with DNSe sound enhancement and 3.5 mm jack, Wi-Fi access, high quality video recording with multi-format video player. The device features with GPS navigation, Digital compass and location based services with access to Google Maps. The cost of Samsung Galaxy Fit S5670 in India is around Rs: 9300/- and our rating is 4.5/5. 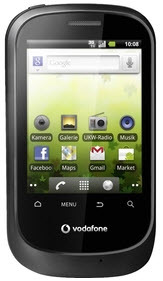 10) HTC Wildfire: The HTC Wildfire is a full touch android 2.2 mid-range Smartphone which is very economical. HTC Wildfire comes with a 5 MP camera with LED flash which allows you to capture low noise photos and videos even in low light. HTC Wildfire has a highly intuitive HTC sense user interface, Wi-Fi, GPS and 3G connectivity. The device is powered with a 528 MHz processor and handles most of the apps without lag. HTC Wildfire has a 3.2 inch capacitive touch screen and features an optical track pad for streamlined navigation. HTC Wildfire has a 384 MB on board memory and supports microSD cards up to 32 GB. This HTC Smartphone is powered with a Li-Ion 1300 mAh battery and can give you a solid 4hours talk time. HTC Wildfire comes with preloaded with Facebook, Flicker, Twitter and Etc. It also has the leap view feature which gives a quick overview of your home screens and a shortcut to easily switch between them. The cost of HTC Wildfire in India is around Rs: 9999/- and our rating is 4.5/5. Apart from these top 10 cheap and best android phones, you might also like few other phones which are currently booming the market. Check out the amazing phone below. Hope you liked our Diwali special article on cheap and best android phones. Make your Diwali memorable this year with these cheap and best android phones. So what are you waiting for? Go get your latest android phone this Diwali. If you got any doubts on this article on cheap and best android phones, please let us know. We wish you all a Happy Diwali 2011. Stay connected with us via our group: Join Coolpctips Facebook Group. Read more about the 5 best smartphones under 15000 for Diwali 2012. My cousin is thinking to buy Galaxy Fit but I recommend him Ace. Which is better? I want to buy a mobile phone,,my max bugdet is 15k Rs and I liked Samsung Wave 2,,all the features in it are exactly what i wantd except it has Bada OS. So thot u can help me with a better choice(mean Android OS). What about Sony Xperia X10 mini pro?? Or any other u can suggest?